Promoting a positive environment for women. This year, my sorority Alpha Omicron Pi participated in the Illinois Body Project. The Illinois Body Project focuses on establishing a positive and healthy body image for women. This semester, five sororities on campus participated, but the goal is to spread this project to every sorority on campus and eventually to all women. It is a research-based program that is proven to change the mindset about body confidence and spread positivity among women. This project explores body confidence in a unique way. It is so important to be able to have an open conversation about body image, and that is the main goal of the body project. Body confidence is not something too easily come by especially in today's society where women are placed into categories and expected to reach unrealistic expectations. Even though we all have different experiences in life, so many girls struggle with the same issues when it comes to body confidence and just being overall comfortable in the body we have. So much of our conversations are focused on negative body talk anything from "Wow I look like a boy in this" to "She is too skinny, it's not even cute." People's bodies look different and using negative body talk to shame our own bodies or someone else's is never ok. I know personally, I am not always the biggest fan of my body and there are constantly things I would love to change about myself but I just can't. I can't change that I have an athletically built body that does not look good in every article of clothing I wish to wear. I can't change that I have a dimple in my chin and I don't always love how it looks. But on those days I just have to remind myself to not talk negatively about my body. The body project helped to teach me that I am not the only one who feels this way. Lots of girls do. It also taught me how to fight back against negative body shaming even when it comes from myself. That athletic body can dominate a lacrosse field. That dimpled chin is the same chin my grandpa has and it is a constant reminder of him. The Body Project affects people in different ways. Some it just helped to re-establish the idea that each body is perfect in its own way, whereas with others it completely changed their outlook on body image and the negativity they felt about their body. Previously, some of these girls had never had the forum to openly discuss their body image issues. 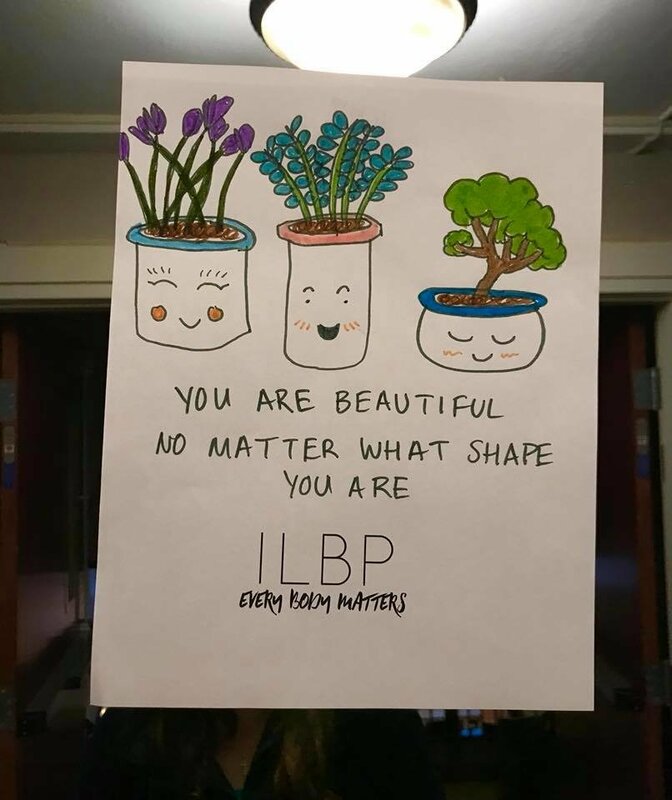 "I have always struggled with body image issues and through this program, I was able to see that I am not alone and that it is just as important for me to build other people up as it is for me to reaffirm myself." "It validated my feelings about societal pressure, but gave us the tools to go out and help change the way society talks about beauty and our bodies." "It was a great way to promote body positivity throughout our house among a wide group of diverse women." I love how this program places such an emphasis on empowering women. Not only did it encourage body positivity within ourselves, but it also taught important lessons about promoting body positivity in others. Sometimes we forget that what we say can have a negative impact on people even if we do not mean it.